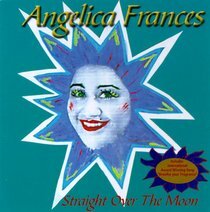 Customer Reviews For "Straight Over the Moon"
Angelica's first album is powerful, and yet simple, her voice, lyrics and music are a sedative to the days stress. I have listened to this album nightly before I sleep since its first release in 1996. I recommend you listen to it and be blessed. Many of my unsaved friends who have bought it do the same as me. Angelica has 4 albums out and I recommend you buy them. The latest, which is the best and cleanest praise and worship album I have ever heard, is titled "By royal decree". I have them all.